I know if a friend who was a home baker and a professional foodie. I once visited her home and was so surprised to see how will furnished her kitchen was. The kitchen looks like a set from a cooking show, fridge and food well stocked, it was so cozy I can almost use it as me bedroom. If you are a baker, a cook with decent skills, you might have just found yourself your side hustle. Everyone loves to eat, but not everyone can cook or have the time to cook, if you can feed and satisfy them, you will be rewarded! Check out some of the ways you can leverage on your cooking, to feed and generate a side income! Pass by any community centers during the day and chances are, you will see middle-age Singaporeans enriching their lives by exercising, leaning a new sport, doing tai chi, and taking up cooking courses inside. Most of the community centers have great cook facilities for teaching and learning, we just have to buy our own ingredients and provide the recipes. You can be a trainer, or a PA trainer, in the community center by just registering here. This is also a great way to contribute and bond with your community personally! Many fantasize about running a café, or a restaurant, but without really deep pockets, it is almost impossible.All thanks to the internet, everyone make money on our own, from using our homes to ours cars using Airbnb and Uber. No car, no spare room? No problem, Bonappetour allows you to host meals in your home, and people will pay you for your service! Also check out Plate Culture, these 2 sites will allow you to run your home restaurant, where tourists and locals craving for local home-cooked food can make bookings online to enjoy your cooking. Thanks to Facebook and Instagram, home bakers are now able to market their homemade pastries and snacks. We all see homemade Chinese New Year snacks when visiting our relatives, and these bakers make delicious and customizable snacks according to dietary needs such as a gluten-free diet. Friends and relatives are more likely to approach you over another bakery or home baker so that is where you can start selling. In recent times, Singapore café owners a reportedly feeling threatened by the rise of home bakers making cakes and pastries, and that baking at home can be a sustainable side hustle on top of your current job. Many of us are too busy or do not like to cook our own meals, and eating out every day may be too expensive and unhealthy. Maintaining a healthy diet is getting tougher when our busy schedules and limited time, that is why we see an increase in Singaporeans getting into meal subscription services. 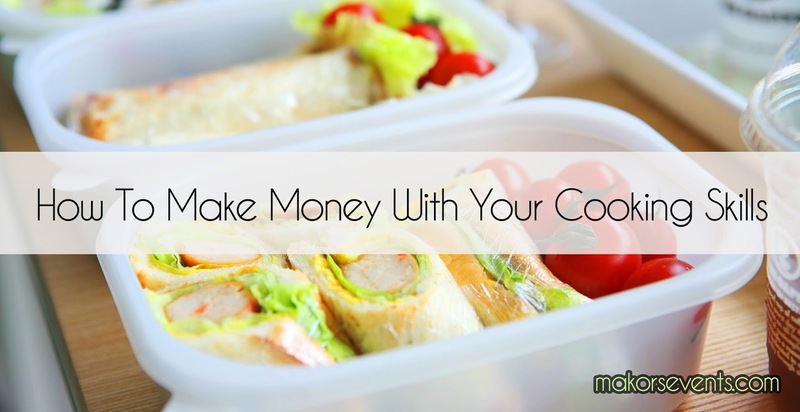 If you are already preparing your own meals to work every day, you might as well earn extra cash by preparing a few more portions for the people working with you. You do not have to be an excellent chef to be preparing meals for your colleagues, if you have been bringing your own meals to work, most of your colleagues have already tried your food and you will know if they like them. Send a message in your Whatsapp group chat to take orders for tomorrow’s breakfast and you will not be surprise to receive many response especially health conscious colleagues who are sick of every day unhealthy hawker food. We are a group of kids party planner that loves what we do. Sharing our knowledge to the world has been our new found love and what better way to share it than through a blog! Lifestyle Makers By Makors Events ThemeXpose All Rights Reserved.